It is ditto package of previous one with flip open cap. It is available in all sizes and we can carry it with us easily everywhere. 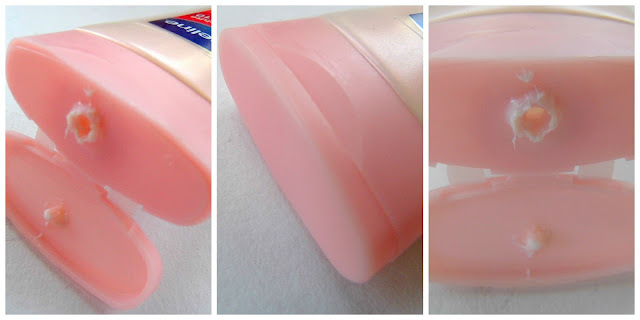 The colour of this lotion is light pink and the texture is little runny. The smell remembers some unknown flower but resembles the previous version of this lotion exactly. I love this smell very much. Vaseline moisturizing creams are my love already, so I was excited to try this new version of Vaseline Healthy White Complete 10 Lightening & Anti Aging Lotion. I am an addict to this lotion's fragrance, especially this new lotion's moisturizing power is very good. It moisturize the skin very well and keep it soft and supple. This lotion absorbed by the skin easily and hydrates the skin for long time. 1. Visible Skin Lightening - False, It won't removes the old stubborn Tan and it just brightens the skin when we apply. 2. Even-Tone Restoration- 60 % True, it even out and tones the skin a bit by regular use. 3. UVA&UVB Protection- Since there is no SPF still I believe it protects skin from sun rays. 4. Dark Mark Reduction - Yes it is true, my hand's dark marks got reduced. 5. Radiance Boost - Not sure, I didn't see any miracle radiance. 6. Skin Feels Firm & Tight- Yes whenever I apply this lotion I feel my hands looks younger. 7. Visibly reduces Fine Lines- Not Sure, I don't have fine lines but I hope this lotion helps to reduce fine lines. 8. Helps Skin Renewal- Yes, It will help skin renewal as it hydrates and moisturize skin very well. 10.Deep Nourishment - Yes it nourishes the skin well by regular use. I am loving it's moisturizing power and it's mild floral fragrance very much. Though I have lot of moisturizing creams in my stash, I prefer to apply this lotion whenever I go out. Hydrates the skin very well. Keeps the skin soft and supple. Easily absorbed by the skin. Reduces the dark spots by regular use. Goodness of Vitamin B3 and AHA helps to tone up the skin. I cannot say it is helping in tan removal. Over all it is a good moisturizing lotion which keeps the skin smooth, soft with awesome fragrance. Worth to give a try other than its false claim of skin lightening. Let me go to the outlet and see if I can find this lotion over here. Lotion for my body is a must and certainly after reading your review, a take for me too. I lam liking the new bright packaging of Vaseline lotions.. so temppted to try my old favorite!! ..
Ho Janu Thanks dear how was your weekend? Thank you Teju dear :), What is your favourite moisturizing cream? Thanks pree, you mean your favourite lotion? mmmmhhh now I wanna try it for sure! Perfect review as always darlin! your reviews are the best! Well written Radha, another perfect review!!!! Have a lovely week my beautiful friend! I love vaseline products. Thanks for the review dear. Loved the review! I like cocoa one from Vaseline. The older Vaseline healthy white helps in removing tan..